The Dutch colonial masters suffered a double whammy during the war. They were invaded not only by Japanese forces but also by British stamps. 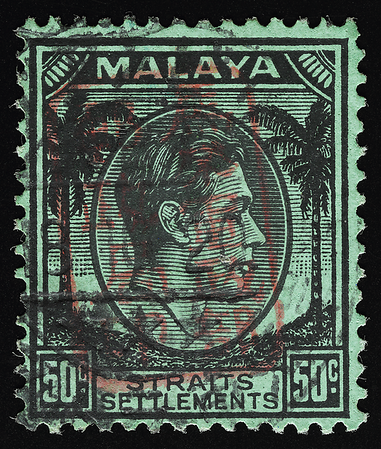 A relatively small quantity of overprinted Malayan stamps was issued in many parts of the former Netherlands East Indies—Sumatra and the Riau and Lingga archipelagos—which were administered from Singapore by the Imperial Japanese forces (Kearney 1982, Proud & Rowell 1992, Tsuchiya 1999, McEwen 2014, Rivett 2014, Vosse 2017). 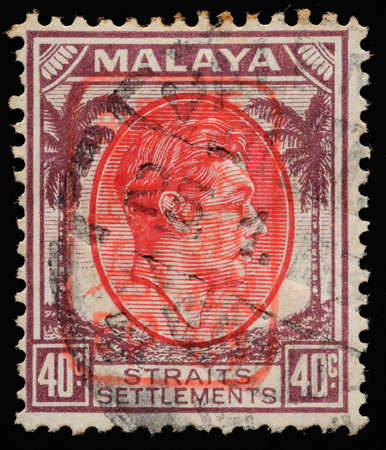 This stamp carrying the Japanese-Malayan single-frame overprint was postmarked in Palembang, where the great explorer and naturalist Alfred Russel Wallace had first made landfall on Sumatra in 1861. The datestamp is typical of those in general use in Sumatra at the time, with a central grill of vertical bars. During World War II Palembang was a strategically important city with an airfield and nearby petroleum refineries. Tugboats from Singapore took refuge there from the bombing of Singapore shortly before the British surrender (diary of Reginald Walter Henry Millen, Admiralty Pilot and Master of H.M.Tug St. Just). But Palembang too fell to the Japanese the following day, on 16 February 1942. The Chrysanthemum Seal of the Emperor of Japan reigns supreme over the Coconut Duty Plate of the British Empire. The Buddha, who abstains from all forms of violence, must have had a hard time, with war raging everywhere. This is from a money order card postmarked in Padang, which on Sumatra was second in size only to Palembang and situated on the opposite coast. The earthquake-prone city vacillated between Dutch and British rule until it fell to the Japanese. The so-called long-bar cancel featured here, with the date bar spanning the diameter, was first produced at the Utrecht mint in 1916. By 1920, long-bar cancels for the Netherlands East Indies were produced in Batavia (van Nieuwkerk & Vosse 2013). The grilled interior made it more difficult to clean stamps for reuse. Tandjong Balei was the main town in the Karimun islands, which during the Japanese occupation became a major transit point for the smuggling of goods (including rice, pigs, cigarettes and wine) between Java, Sumatra and Malaya (Kratoska 1997). The datestamp, sporting the attractive style of a segmented outer ring and dot matrix interior first seen circa 1912 (Govett 1965), was used from 28 November 1942 to 22 November 1943 (Proud & Rowell 1992); the lower part of it (off the stamp) reads 'KARIMON'. The perceptive designer made the outer rim thicker than the inner one, giving the datestamp a subtle touch of three-dimensional relief. The dent on the rim suggests that the chop had been dropped on the floor; even the beefy outer rim was not prepared to take the impact. Here, parts of the date and time slugs were blacked out by the Japanese to show only a date, as time was deemed less important (van Nieuwkerk & Vosse 2013). The Japanese year is shown (see Kearney 1982). The Dutch datestamps were eventually superseded by Japanese katakana datestamps in northern Sumatra (van Nieuwkerk & Vosse 2013). These show the kanji characters for "Dai Nippon" just above the date slug and three stars below it, as if denoting the rank of the lieutenant-generals and vice-admirals who often led the battles in the East Indies. Japanese overprints originating in the occupied Netherlands East Indies were used on the coconut definitives as well. 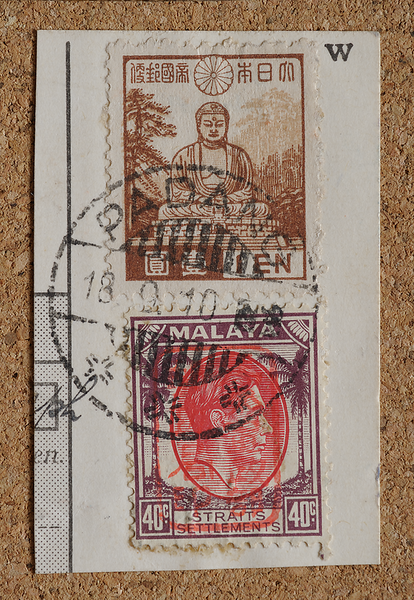 In north Sumatra, some coconut definitives already bearing overprints from Malaya were (possibly inadvertently) given an additional 'Dai Nippon' overprint in Kanji characters enclosed in a horizontal rectangle (Bleeker 1982, Proud & Rowell 1992). This additional overprint came in black, violet or red, and varied in the dimensions and waviness of the rectangle (Bleeker 1982, Proud & Rowell 1992, Tsuchiya 1999). Even more astonishing were extremely rare instances of coconut definitives with the DAI NIPPON 2602 MALAYA overprint being given two additional handstamped overprints, an obliterating cross and a line of Kanji characters reading Dai Nippon Yusei ('Postal Service of Greater Japan'). 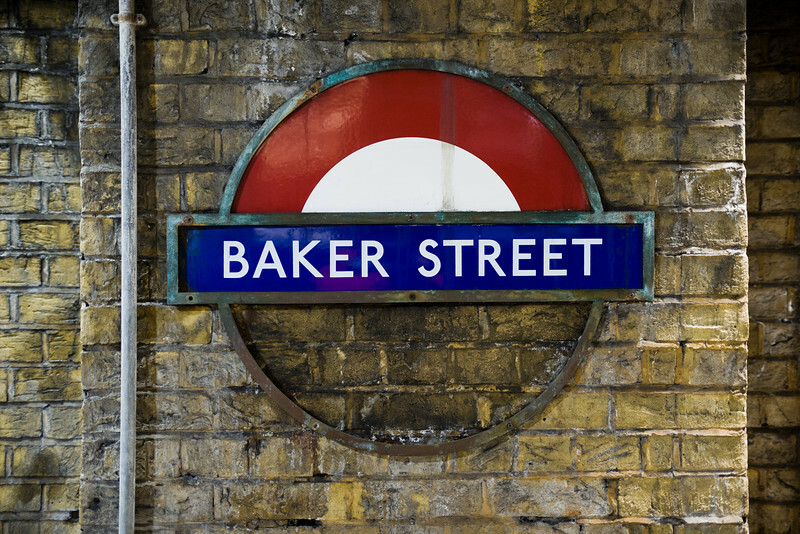 They are so enigmatic that philatelists debate their existence. 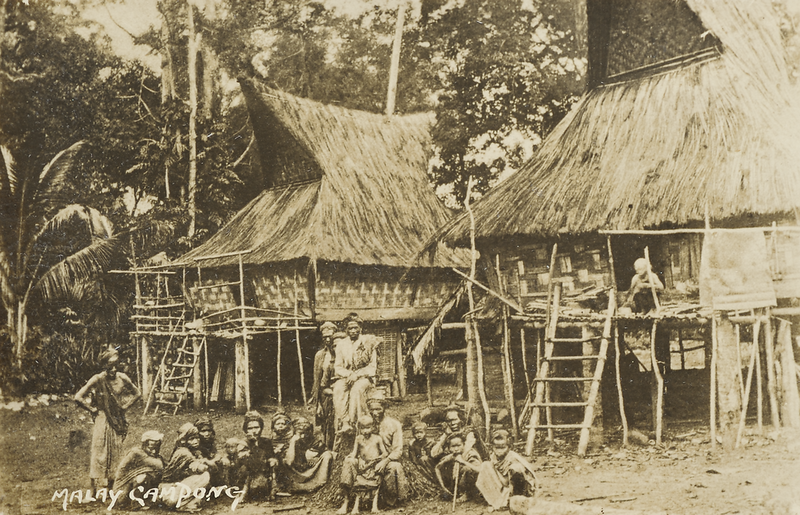 Batak houses or rumah bolon, their roofs modeled after the boats that carried the people to north Sumatra 2500 years ago (Evans 2017). The sprawling archipelagic abode of the coconut definitive pulsates with cultural and biological diversity (see Wallace 1869). Tectonic plate boundaries give it fiery volcanoes and earthquakes. Mirroring this diversity and dynamism were the great variety of Japanese Occupation overprints and postmarks on the coconut definitive, probably the greatest for any single stamp design. The schooner Four Friends, on which the author sailed the former Netherlands East Indies from Java to Borneo in 2018 under the command of Captain Warren Blake. 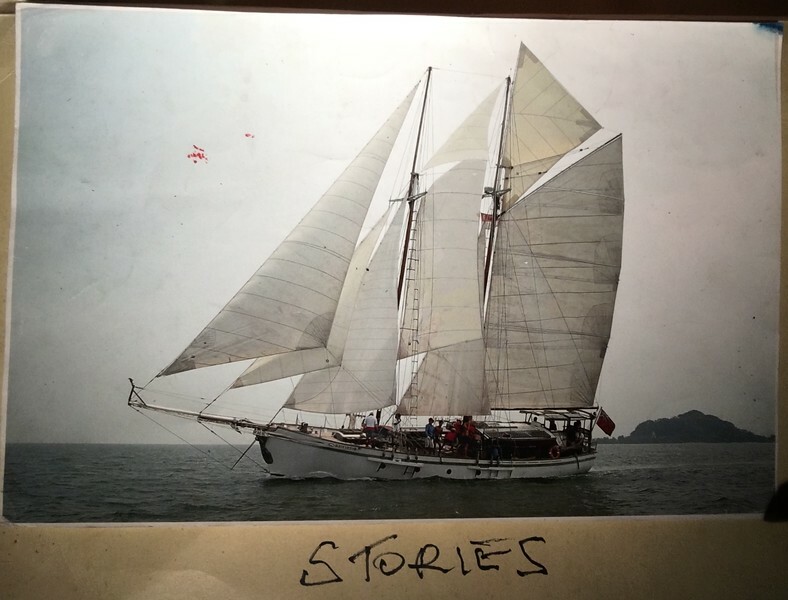 Photograph found in a folder of seafaring stories written by the captain.